Will students still do the work you assign if you don’t give them points for it? Yes–especially if the work is valuable to them. In the previous post in this series, I outlined what I thought it should mean for a student to get an “A” in my language arts class. In essence, that list makes up my intended learning objectives for the course. Following the precepts of backwards design, next I have to think about where I’ll be able to see whether or not students have met those goals and then I’ll need to plan instruction to help students get there. Objective: The student is a reader with a vibrant, self-directed reading practice that will continue beyond my classroom. Read more books than they initially thought possible. Read books that matter to them. Provide ample opportunity for my students to choose what they read. We will have some shared reading experiences (one whole-class book each semester) but the bulk of student reading will be individual choice or book groups. Give students time to read. Ten minutes at the start of every class period gives students 40 minutes per week. This also gives me time to conference with a few students about their reading every day. Get quality titles in front of students. A classroom library isn’t practical for me (see my post on this here). But our school’s library is fantastic–more time there. Get students talking about books. Student response groups can help with this as will an online collection of books students have read and what they think about them. (currently building this as a WordPress site that a student aide will manage for me). (see after the second horizontal line below for the rest of the list) (or if you’d rather see my thinking laid out as a table, click here). I try to make myself do this kind of thinking through my classroom every year–so I’m grateful that this blog post gave me a chance to do that work. It was thinking I needed to accomplish before I have students next week. I always find areas I want to focus on to improve (this year: more work with mentor texts, more focus on writer’s notebooks, more conversation about books…). I encourage you to do something similar as a thinking exercise. I’ve even created a table for you to use if you want (it’s a google doc–you can grab a copy of it here or in the folder that you’ll see a link to at the bottom of this post). This post started with a question–will students work if there are no points offered for each task? If the work is valuable to them, yes, they will work. Using the concepts of backwards design reminds us that valuable, meaningful classroom work hinges on starting with valuable, meaningful learning objectives. For me, these are not strictly the standards or curriculum objectives laid out in my district curriculum guides. They are the bigger concepts, the reasons why we teach reading and writing to begin with, the most important work of my classroom. If I start my thinking and planning there, then the work that comes out of my planning for my students will be valuable. Based on my intended outcomes for my students as a result of my classroom, I’ve found that the reading/writing workshop approach best gets us to those outcomes. My students need choice and time to work and lots of feedback and a community of readers and writers–these things all scream workshop. That is not to say that other approaches can’t work in a gradeless classroom. It all starts with your intended outcomes–what do you hope your students will accomplish as readers and writers as a result of your class? How can you craft a classroom experience that will get them there? There are things I’ve had to set aside in order to get my students to the place where they are using reading and writing to read their complex world in order to write their futures within it. I’ve set aside the idea that my students all must be doing the same thing at the same time. I’ve set aside the idea that I should choose the books they read and that we read them all together. I’ve set aside the idea that I can read and respond to every single piece of writing I ask them to write because they simply must write more than I have time to respond to. It hasn’t been easy to set these things aside, but my classroom has been better for it. And I’m getting closer and closer to a lively reading/writing workshop every year. Trying to make workshop happen in a high school classroom has been one of the most difficult challenges of my teaching career! (Check out the phenomenal discussions about the high school workshop classroom over at Three Teachers Talk and at Moving Writers or my recent posts from #UNHLit16 if you want to think more about workshop). 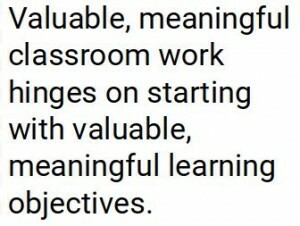 The list of qualities of “A” students from my classroom/learning objectives has one central purpose: to help me plan my classroom experience around meaningful work for my students that will keep them working. That list is not the rubric for my students’ semester grades–I negotiate the grade agreement with my students ahead of the first 6-week progress report deadline so that the progress grade I post for each student is the one they determine for themselves based on our grade agreement. I wait to approach the grade agreement conversation with my students until they are well marinated in the work of my classroom and we have a healthy collection of data (mostly qualitative) on each student’s progress in the gradebook. Only then will they really be able to enter into a conversation with me about what should make an “A” for our class based on the work the class asks of them and how well they’ve been accomplishing it. And if they help to define the set of objectives to which they will eventually be evaluated, they will be so much more invested. They will own it. The next thing I need to think through is setting up my gradebook to collect the data I need to know if my students are progressing toward the learning objectives/qualities of “A” students. So that will be the focus of the next post. First day back to work tomorrow–I’m excited to see my colleagues and intrigued about the top secret field trip our admin team has planned for us. We see students for the first time next Thursday (9th grade only) and Friday (all grades). Best of luck to those of you who are starting with students this week. This is the third post in a series about not grading in the high school language arts classroom. And I’d love to hear from you to help me craft this series. Either leave me a comment below or fill out this quick form. Objective: The student writes to think through life, to pull ideas together, to say something important to a targeted audience and for a specific purpose. The student is intentional about form in order to meet the needs of the audience and purpose. Make independent decisions about the form their writing needs to take depending on their intended audience and purpose. Write about topics that matter to them. Provide lots of choice regarding what they write about and how they structure it. The weekly draft structure creates space for this–students turn in a draft each week of their choosing with their choices scaffolded by the punch list to be sure their choices enable them to hit the requisite course curriculum objectives. I’m planning for notebook writing time on Mondays and Tuesdays and then writing time with computers for some or all of block days and Fridays. Any of these blocks of writing time will give me time to conference with students one-on-one or in small groups. Show students many many models of different types of writing to imagine possibilities for their own. Help students to come up with ideas for writing–from reading, from discussion, from responding to what’s going on in their lives. Objective: The student revises extensively to improve a piece of writing. Work on individual pieces of writing over lengths of time, achieving several different drafts. Provide the opportunity for students to revise writing, not just to produce it. I can ask students to revise for a few minutes after a short time of notebook writing to get them in the consistent practice of revision. The thorough revision task does ask students to revise extensively–they’ll do this three times per semester. I’ll teach revision alongside peer feedback so students see how feedback from writers drives revision. With frequent mentor text use, I’ll show students how they can turn to mentor texts to get ideas for revision. Objective: The student asks complex questions and persists to research answers to them. Stick with a singular research topic that interests them over a period of time, beginning with a research question of their own design. Provide space for meaningful research tasks and instruction in how to navigate the research process. The first semester feature piece task after Thanksgiving break will be a research task based on students’ own questions and interests. There will be mini lessons along the way on various pieces of the research process and the semester punch list will help students focus on doing research work. I will also conduct a research project and model my process for students so I can teach from inside of the task. Objective: The student seeks out mentor texts–for writing, for text form, for thinking, for reading–and uses those mentor texts to grow. Locate their own mentor texts to help them think through a writing or reading task that they are taking on. Provide access to high-quality mentor texts and show students how to use them as guides for their own work. I’ll put mentor texts in front of them every week and show them how to learn from them. The online database of the mentor texts we use will be available for students to use on their own. Objective: The student maintains a writer’s notebook as an important thinking/reflecting space. Bring writer’s notebooks to class every day and will work with them carefully. Show evidence of thinking and reflection in their notebooks, inspired by what we do in class. Turn to their notebooks to do this work without direction from me. Create my own writer’s notebook that shows students one possibility for their own thinking/reflection tool. Provide opportunities for them to share awesome tidbits from their notebooks with the class in small and large groups. Write, turn, and talk activities provide opportunity for this. I also plan to acquire a document camera so I can put notebook pages up for students to see, both from my notebook and from students’ notebooks. Have students write in their notebooks for meaningful reasons nearly every day. I don’t collect notebooks ever but I do monitor how students are using them in class and we look at them together in conferences. Objective: The student manages digital tools and digital spaces effectively to keep track of work. Persist in working through confusion regarding how a digital tool/space works. Use digital tools and spaces consistently and effectively for class work and collaboration. Choose just the right set of digital tools/spaces so that these are manageable and not overwhelming. I’ve built one WordPress site to be a space for book conversation and recommendations. I may build another to be our resource for mentor texts we’ve used in class. We have a class blog to publish student work. I expect students check Infinite Campus frequently to see the story that builds there about them as readers and writers (I use it to keep track of my conference notes, for example, and after time this becomes a detailed story about a student as a reader and writer in my class). I expect students to check their district gmail account frequently. I’m considering using Twitter more frequently than I have in the past–if for no other reason than helping students to become more literate with this powerful social networking tool. How might it enhance our classroom community and our work? Provide enough instruction to each student to show them how to use the tools/spaces effectively. In-class time on computers is critical as it provides opportunities for me to walk students through how to use our digital tools/spaces if needed. Objective: The student is a positive community member: provides high-quality feedback to peers on their writing, participates earnestly in small group and whole-group conversations, moves through our classroom spaces (physical and digital) with kindness. Create a positive, vibrant classroom community. Take great care in responding to each other’s work. Share their ideas with each other in class conversations. Help each other through struggle and support each other’s work. Work on teambuilding and communication to create an atmosphere where groups can thrive. I’ll structure students into small 3-4 person response groups as I usually do, spending some time getting to know them and having them get to know each other first before making the groups. They’ll stay in response groups for the duration of the semester as their home base in the class. I’ll expect that they look out for each other in the groups. Provide lots of opportunities for small-group conversation. Teach students how to do peer feedback effectively so they can help each other with revision. I plan a feedback/revision book camp in the second full week of school so we can establish a focus on this right away. A feedback circle might be a great way to do this–worked great with my 9th graders last spring. Then as we go through the semester, I’ll monitor the conversations with each other on their writing via the comments they leave in the margins of each other’s drafts and look for opportunities for continued instruction with individuals, small groups, or the whole class. Objective: The student demonstrates successful student habits: meeting deadlines, reading and following instructions, asking questions, seeking help and support. Turn in work that shows they have read and followed instructions. Ask questions when they have them. Seek out help and support when struggling. I’ll use the gradebook to record data on how they’re doing with these things so they and I can see patterns and trends that need to be addressed. Make it a safe atmosphere to struggle, to ask questions, and to seek support. As I work alongside them, I can share my struggles with them and ask my students to help me find ways to navigate them. This makes it okay to struggle and help each other. Objective: The student takes risks in order to learn. Take risks in class discussions. Take risks in pieces of writing. Take risks in the books they choose to take on. Make risk taking (and the mistake making that is part of it) a valuable piece of the classroom. By working alongside them (i.e., doing the work I assign them), I can model risk taking and mistake making. We can celebrate mistakes made and the learning that comes from them. Conferences will be important places to help students learn from mistakes and to encourage them to take risks. Objective: The student practices effective self-reflection, self-evaluation, and metacognition. Students know what they already know, what they want/need to know, what they’ve learned, and how well they’ve learned it. Use curriculum objectives/standards throughout the year to help them think about, plan, and evaluate their learning. Provide opportunities for students to do this important planning and reflection. As I’ve done in the past, I’ll ask students to choose focus standards for themselves from the CCSS for each semester, to paraphrase them into their own words, and to explain why they want to work on each standard they chose. Show students what it looks like to plan their learning and reflect on it effectively. I have umpteen examples from students past to make available to current students. This entry was posted in #StopGrading, blog series, CCSS, fall 2016 blog series, grading, making change, not grading, workshop teaching. Bookmark the permalink.